For millennia, people washed clothes by stirring, hitting, squeezing and generally agitating them in rivers or buckets of water. The basic mechanism is to loosen dirt particles and use the water to wash them away or dissolve them. Mostly, washing machines just automate the same process, agitating clothes in water, sometimes with detergent, to remove dirt from the fabric. Most use detergent to help free the dirt particles but more recently, some use ultrasound to create micro-cavitation bubbles and when they collapse, the shock waves help release the particles. That means the machines can clean at lower temperatures with little or no detergent. It occurred to me that we don’t really need the machine to tumble the clothes. A ball about the size of a grapefruit could contain batteries and a set of ultrasonic transducers and could be simply chucked in a bucket with the clothes. It could create the bubbles and clean the clothes. Some basic engineering has to be done to make it work but it is entirely feasible. One of the problems is that ultrasound doesn’t penetrate very far. To solve that, two mechanisms can be used in parallel. One is to let the ball roam around the clothes, and that could be done by changing its density by means of a swim bladder and using gravity to move it up and down, or maybe by adding a few simple paddles or cilia so it can move like a bacterium or by changing its shape so that as it moves up and down, it also moves sideways. The second mechanism is to use phased array ultrasonic transducers so that the beams can be steered and interfere constructively, thereby focusing energy and micro-cavitation generation around the bucket in a chosen pattern. 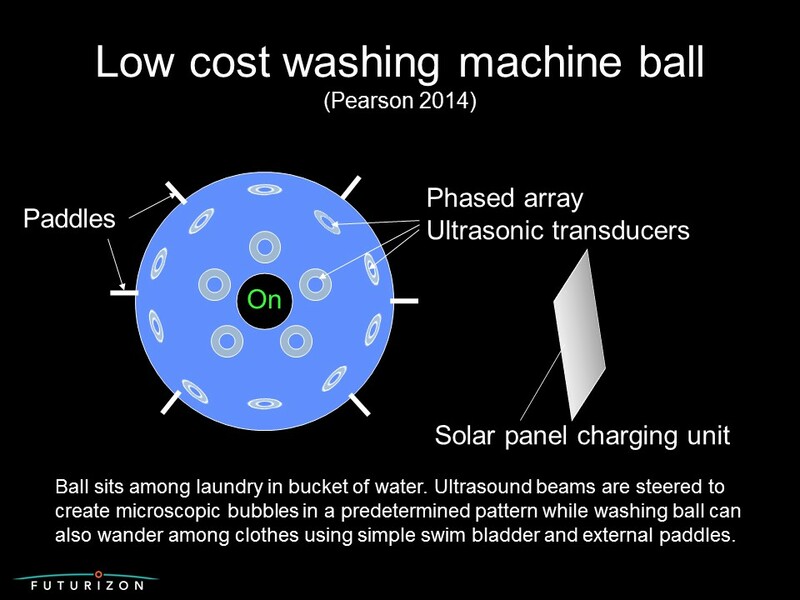 Making such a ball could be much cheaper than a full sized washing machine, making it ideal for developing countries. Transducers are cheap, and the software to drive them and steer the beams is easy enough and replicable free of charge once developed. It would contain a rechargeable battery that could use a simple solar panel charging unit (which obviously could be used to generate power for other purposes too). Such a device could bring cheap washing machine capability to millions of people who can’t afford a full sized washing machine or who are not connected to electricity supplies. It would save time, water and a great deal of drudgery at low expense. The new Raspberry Pi is pretty much exactly what I asked for (though I don’t think it came from my request) . For about £22, you get a computer. You plug in a keyboard and a TV and comms, then start programming. I am amazed it has been so long for someone to do it, but better late then never. Now a new generation of kids can learn how to program by messing about, instead of falling victim to the formal teaching that is provided by schools and university. I have always believed that learning how to hack programs together is the best way to understand what you are doing. You can learn formal methods later if need be. I don’t think hacking is the source of bad habits. Rather, it is more likely to show you the workings of the machine so you can exploit it better. I have seen too many taught programmers make good impressions of being mentally crippled after being forced to think in just one way, any fee-thinking and originality purged. 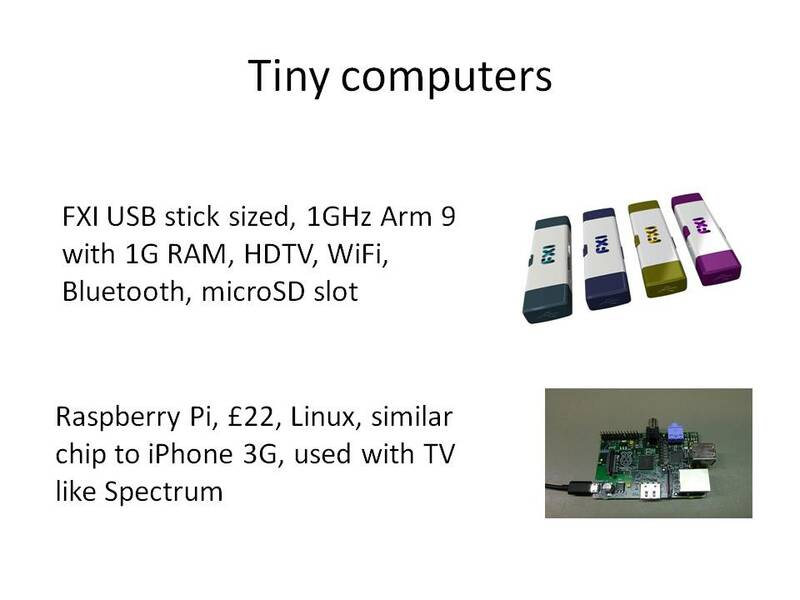 The Raspberry Pi isn’t the only tiny computer around though. FXI also have one, the size of a USB memory stick, and pretty impressive capability, albeit five times the price. It is easy to imagine how devices like this could really change how we work. I like to travel very light and haven’t carried a laptop for years – even the latest are still heavy and big and just aren’t worth the trouble. I won’t even use an iPAD because it is still obese, power-hungry, and altogether too primitive.Turning up at a conference with a memory stick containing your presentation has been fine as an alternative, but you are reliant on the conference laptop having the right setup. If you could bring a full PC memory stick and run everything from that, that would be better. At home it will be good to put media straight onto your TV without cluttering the room up with big boxes. A Slingbox has done that for years, and smart TVs now do it built-in, so it isn’t new, but this makes it a lot easier and cheaper to provide web and media on more conventional TVs. On the go, you need some sort of visual display of course but soon we will have visor based head up displays that work with fingertip tracking or virtual keyboards. Then these compact devices will come into their own. You’ll be fully connected and IT capable, but carrying hardly any weight. Both of these new devices are small but capable, and most of the size they still have left is really interfacing to other devices. The processing guts is much smaller still. There is room to shrink further, and it is clear from these that the era of digital jewellery is almost with us. Imagine the enormous environmental benefits too, if we hardly need any resources to provide for all our IT needs. My best friend Dave Faulkner runs an environmental consultancy. I host a couple of his papers on global warming on the Futurizon web site. We have many a beer over debate about environmental issues. Over the years, I have worked a few times with both Friends of the Earth and Greenpeace. I have a lot of respect for Jonathon Porritt and Doug Parr. We share a passion for a healthy environment, though we disagree on some of the ways to achieve it. It’s the same with my friend Dave. I can like and respect a person without agreeing with everything they say. It is nicer still when some common ground appears. Only a small bit of my work involves environmental issues so I am far from expert in the environment field, though I do have my own embryonic environmental consultancy now. But I am expert at studying the future overall and pretty good at making predictions – I get it right 6 times more often than I get it wrong – and as I look at the many factors affecting the way the world is going, I feel hesitantly optimistic. There is some potential for a techno-utopia but I know we won’t get that. We will take a sub-optimal path that creates as many new problems as we solve. The world of 2050 and beyond will still be a mixture of good and bad, just with different goods and bads. The approach to our environment though is one area I think will improve. On one side, we have the likes of Porritt and Parr, leading much of the green community and doing what they can to motivate people with the desire to live in a nicer world in harmony with nature. I can’t fault that, only in some of the policies they recommend to achieve it, which I think come from occasional flaws in their analyses. On another side, engineers are racing to develop better technologies, sometimes deliberately to help the environment, but more often almost coincidentally making better toys that happen to be better for the environment. Engineers are mostly driven by market forces, but they are still human, and many also care passionately for the environment, so will generally seek solutions that do their job but are better for the environment where the choice exists. In fact, it is hard to spot examples of new technology that are worse for the environment than their predecessors. Market forces, mediated through well motivated engineers, can make the world better just as well as any green. Both can help us move to a better world. I see a lot of needless worrying by environmentalists though, some of whom (I won’t name names) think of scientists and engineers as the enemy. Needless worry, and sometimes counter-productive. One of the big worries this week is that a lot of resources are scarce that we need to make renewable energy, or to make batteries to store it. But almost at the same time, articles appear on inductive power delivery to cars that circumvents the need for large batteries and hence the need for lithium – I even proposed that solution myself a few years ago, so it is good to see it appearing as a project somewhere. New materials for IT are being developed too, so we won’t rely for much longer on the other things that are scarce. So, no worries, it’s just a short-term problem. For the last few years it has been recommending spending trillions to avoid carbon dioxide production. But even without spending any trillions, future energy technology that is being developed anyway will make fossil fuels redundant, so it will take care of itself. Panic is expensive but unnecessary, the worry needless and counter-productive, serving only to slow down the race to sustainability by diverting funds to the wrong areas. The environment has some very good friends in engineering now. Biomimetics is the engineering field of copying ideas or at least inspiration from nature. I’ve occasionally use biokleptics when an idea is blatantly stolen. Nature doesn’t have any lawyers defending her intellectual property rights, but has been using random trial and error for 3 billion years to develop some fantastic engineering solutions and if anything encourages their copying. So, someone looks at spiders and develops a new kind of architecture that produces better structures with less material. Going way back to the 80s, I looked at evolution and made the tiny deductive leap to thinking of evolving software and hardware, then soon after looked at embryo growth and came up with ideas of how to self organise telecomms networks and sensor nets. I love biomimetics. So do many other engineers, and the whole field is exploding now. It will help to make systems, objects, fabrics, materials, architecture and processes that are more energy or resource efficient, and quite often more beautiful.There are a few purists who insist on copying something exactly as nature does it, but mostly engineers are happy to be inspired and make their own tweaks to adapt it to needs. So, long ago, Icarus started the field by copying nature but a century ago we discovered we could make planes more easily with metal fixed wings. Synthetic biology essentially completes the relationship by adding human design into biology. This embryonic field will expand vastly, and will be used for a wide range of tasks from resource extraction and processing, to computing. Nanotech and insights from neuroscience will add more to allow rich interaction between organic and inorganic devices, often bridging the gap to allow us to put electronic devices in direct connection with our bodies, or those of other creatures. This field also allows the wonderful possibility of undoing some of the damage done to the environment, and even making nature work better. Gaia 2.0 will be with us this century. Of course, if we don’t develop all this science and technology, we will be stuck with a human world that is immensely resource hungry and getting worse, using far more resources than would otherwise be needed, damaging the environment, with no hope of repairing the damage. There wouldn’t even be a plus side, because people would also live poorer lives and be less fulfilled and less happy. Having been highly convergent on the goal of making the world a better place, this is where engineers often part company with greens. Most engineers think better engineering is the best route to a sustainable world, most greens (and, it has to be admitted, some engineers) think we should slow it all down. This superficially suggests lower environmental impact, implying that people will consume less if they swap devices less often, or don’t get that next pay rise, but it doesn’t deliver. It is a wrong deduction. In much the same way that poor people are often fatter than rich people, what it does change is the access to a better diet, in this case, of environmentally friendlier technology that really needs extra R&D before it is with us. That funding comes from market demand and the ability to pay, and that needs more people to be richer. For the next several decades, what we need is economic growth, selectively. Again, I start to agree with Porritt here. It isn’t just any growth we need, but growth that is spent wisely, using growth to improve peoples lives, and improving the environment we live in either directly or via R&D and the greener technology it will deliver. Is greed more sustainable than frugality? Sustainability is much misunderstood. Certainly government and corporate sustainability policies often point completely the wrong way. To be sustainable, we must ensure that future generations are able to live decent lives. Not much argument about that usually. But conventional wisdom in the field is that this means we should cut back on consumption. That leap of logic is flawed. Cutting back reduces environmental impact in the short term but that doesn’t necessarily mean it will reduce it in the long term, or overall over any significant length of time. The full lifetime, full system impact is what counts. Achieving a reduction in overall impact well be best served by increasing consumption in the short term, if this leads to development that reduces the later impacts enough to offset short term damage. An excellent example is in mobile phone design. Vigorous marketing and encouragement to replace mobiles frequently seems to many people to be wasteful and environmentally unsustainable. However, the rapid obsolescence cycle here has given us 150g mobiles that essentially replace 600kg of previously needed IT equipment. If everyone wants a mobile phone, or to access to the functions they provide, then the lowest environmental impact is achieved by using ultra-high tech phones that do far more with far less. Increased consumption has led to lower environmental impact. If instead, we had held back development and demanded that people use their phones till they fail, we would still be using a lot of heavy and resource intensive kit that needs lots more energy, generates far more waste, and would need far more mining, nasty heavy metals and pollution. And it wouldn’t work half as well, so we’d have less happy lives too. Greed v frugality? Greed is the more sustainable. Because it leads faster to more advanced technology that is invariably better for the environment. For a fuller analysis of sustainability and technology, download http://futurizon.com/articles/sustainingtheearth.pdf. It is free.